Coconut Essentials #Valentine's Day Review and Giveaway! Do you use Coconut Oil for everything like me? If not you are missing out! Do you even know all of the benefits of Coconut Oil has for your skin? Coconut oil is perfect for either a facial cleanser or a moisturizer. The use of coconut oil as a cleanser involves emulsifying and massaging it into the skin before rinsing it off with warm water. The benefit is that coconut oil doesn't strip the skin of its natural oils. Skin stripped of its natural oils not only feels dry, but the glands overproduce sebum to compensate. This overproduction leads to clogged pores and acne.Coconut oil's unique moisturizing properties make it ideal as a facial moisturizer. Saturated fats and medium-chain fatty acids compose coconut oil. These trap moisture in the skin while leaving the skin's surface lipids intact. Coconut oil also has antioxidant and antibacterial properties. They reduce inflammation and help heal the skin's natural barrier. Coconut oil works well as a makeup remover, too. All that's required is massaging the oil into the makeup and using a cotton pad to wipe it off before rinsing with warm water. The benefits of using coconut oil this way include removing even eye makeup gently while keeping the skin hydrated. I have been using Coconut Oil now for many years and am constantly finding new uses for it. I was so excited when I got to try the full line of Coconut Essential's Products! Coconut Essentials has adult and baby products. So my kids got to try Coconut Baby also. I only use all natural products with my kids so I was super excited. My children all have sensitive skin and are allergic to almost all detergents and regular mass merchandiser toiletries. Coconut Baby uses one hundred percent all organic ingredients. It helps sooth skin and heal skin. It is even a treatment for cradle cap. My daughter loves using lotion like mommy so I am so happy she can use her own Coconut Baby! 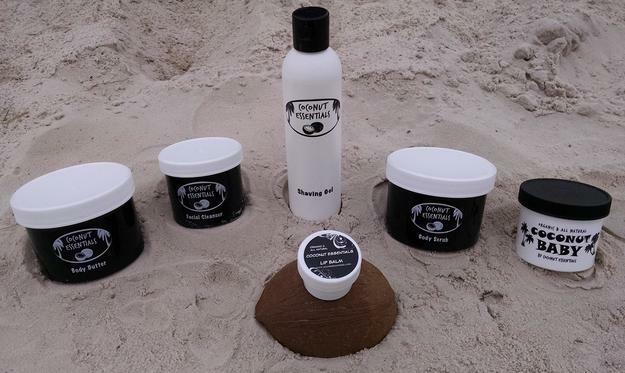 We also got to try the entire adult line of Coconut Essentials products The Body Scrub, Face Cleanser and Body Butter! You can purchase any of those here. I loved the Face Cleanser it exfoliates amazingly and leaves skin soft and not dried out like a lot of facial cleansers. The Body Scrub feels delightful on your skin and is also a perfect exfoliator that doesn't leave you feeling dry because of the Coconut Oil Ingredient. I love using it on my feet! The Body Butter is amazingly moisturizing. I love the whole adult line! Coconut Essentials wants to give one grand prize winner their own Coconut Baby product and 3 runners up a $3.00 coupon code off Coconut Baby! My favorite product is the body scrub. My favorite product is the face cleanser! I like the body scrub. The face cleanser sounds awesome. Something gentle. I would love to try the Coconut Face cleaner, I have heard so many wonderful things about coconut . I got it today. So cool. Thank you!